Back to back holders, Real Madrid met Liverpool in the 2018 Champions league final in Kiev. Without a league title to fight for, or any other trophies this clash had dominated the thoughts and preparations of both sides since they progressed from their respective semi-finals. 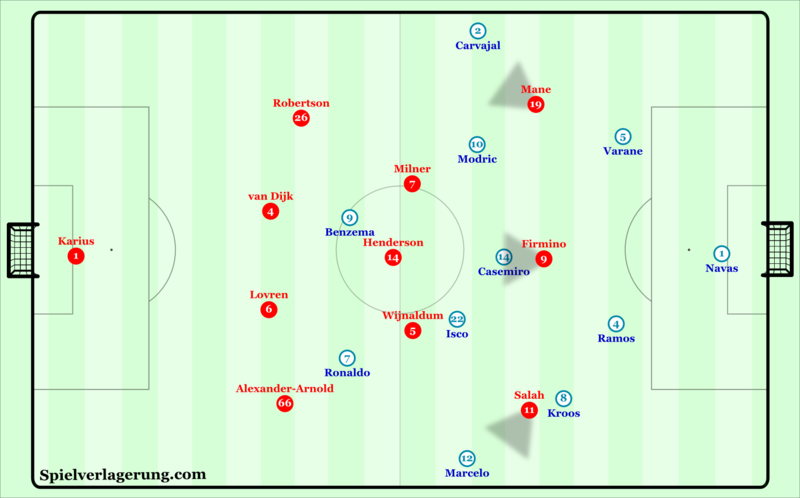 Perhaps the most interesting and important aspect of the game was how Liverpool would attempt to press Real’s wide and deep build-up structures, and create a more chaotic transition game than the Spanish club would feel comfortable in. Interestingly, Klopp decided to stick with his usual 4-3-3-0 pressing structure. Every defensive formation has particular spaces which can be difficult to control due to the absence of players in these areas. In a 4-3-3, the space behind the central striker is the initial “problem area”. Solutions to closing the 6 space may leave other spaces, such as large space in front of the full-backs if the wingers stay high and narrow, or large space either side of the 6 if the 8s step up. 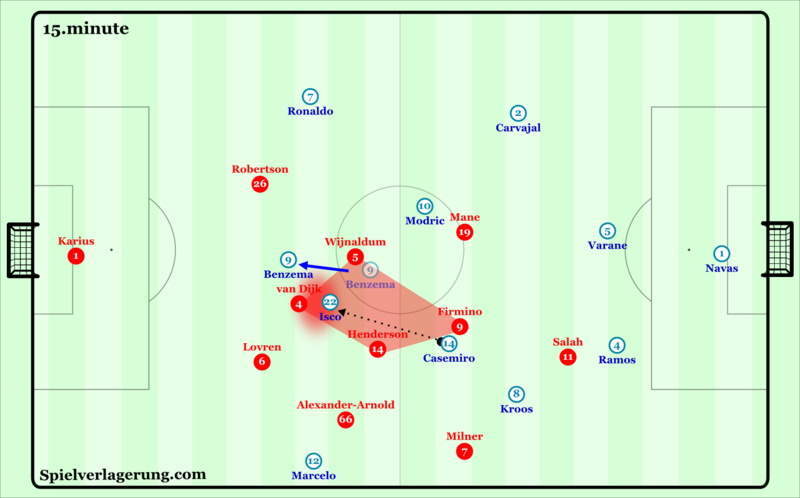 Liverpool attempted to control the 6 space with Firmino staying deeper and using his positioning to either block or narrow the passing lane into Casemiro. Mane and Salah lurked in the lane between the Real centre-back and full-back on their side, in an attempt to retain access to both. These pressing roles came at the expense of immediate access to press Real Madrid’s first line. However, they were strong at reading particular triggers and moving out of position with good timing to create access. The main trigger was when they were able to block progression on one side, and the ball carrying centre-back looked to switch. The winger on the far side, would hold an initial position to threaten the long switch to the Real full-back, encouraging the pass across to the far centre-back and moving to attack the pass just before it was played. Of course the closer a player is to the ball, the larger their cover shadow is, and by moving early for access Liverpool’s wingers were able to block multiple options in these situations, forcing Real to play backwards. With the execution of their plan, Liverpool’s pressing was fairly effective in the opening exchanges. Although they were largely unable to win the ball in Real’s third, they won possession in midfield areas quite regularly and were rarely played through in the opening 20 minutes. From a Real Madrid perspective, their early struggles were largely due to playing too often in areas which Liverpool could control. In the early minutes of the game, they were slow to move into strong build-up structures. The deep positioning of the Real full-backs meant Liverpool’s wingers could have access to both, and press the centre-back on their side whilst blocking the diagonal pass to the full-back. Their midfielders, Kroos in particular, were at times found in deep and central positions where it was easier for Liverpool’s midfielders to step up and press whilst blocking the line into the space they just vacated. After a few minutes, the Spanish side began to space themselves better in possession, particularly with higher full-backs, and Kroos dropping into a more usual deep and wide left half space/wing position. As such, they were able to create more time and space for Ramos and Varane in build-up. However, they were still largely unable to use their possession to force Liverpool to defend deeper. Zidane’s side still lost possession frequently in midfield areas which was largely down to poor decision making. They often played forwards too early into players who lacked supporting structures for lay-offs. This combined with the pressing from Liverpool’s defence, and backwards pressing from the midfield and Firmino meant the Real attackers faced heavy pressure with little or no options. Naturally, when Real struggled to faced compact and intense pressing which they couldn’t break through on one side, they looked for switches to find alternative routes forwards. However, Liverpool were strong at dealing with these. As explained earlier, the wingers moved early to press switches to Ramos or Varane. The Liverpool full-backs were also quick to press on switches to Real’s full-backs. The closest centre back was allowed to move to the wing to defend against potential flick-ons, with Henderson dropping into the back line. In their own possession phases however, Liverpool were able to reach the final third with fair ease. Real Madrid’s full-backs were tasked with man-marking Salah and Mane, and were thus drawn into very narrow defending positions. Real Madrid’s midfield line was also narrow in their attempts to block passes into Liverpool’s narrow forwards. As such, the English side could simply switch to their advanced full-backs in large space and create crossing or even shooting opportunities. Around the half hour mark, perhaps due to a combination of Salah’s injury, the resulting re-shuffling of Liverpool’s forward positions and fatigue, Liverpool’s performance dropped significantly, with Real heavily dominating the 15 minutes before the interval. Klopp’s side were now visibly slower to read triggers, leading to worse timing of pressing movements and thus being easier to play through. This began from the forward positions where Lallana and Mane were now slower to press on switches to Ramos or Varane. 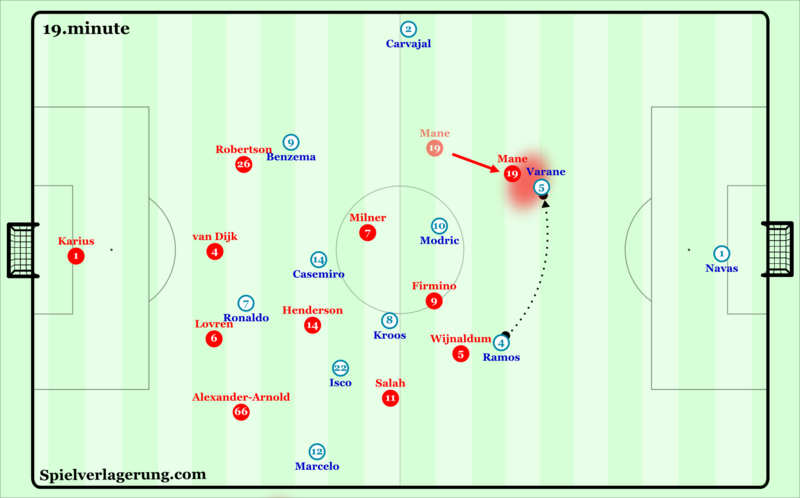 By arriving later to press, they left the receiving centre back with more options to outplay their pressing. This had a knock-on effect on the deeper players who could not move out of position as early as previously due to having more potential options to defend against. Furthermore, Zidane’s men increasingly focused on playing in Liverpool’s problem areas, namely the wings. The Spanish side flexibly created structures to combine on the flanks with Ronaldo, Benzema, Isco and at times Modric roaming from flank to flank to support the full-backs. These players were also used to run in behind on the wings in line with switches to the full-backs, tying back the Liverpool full-back and allowing Real to better stabilise their possession in these situations. This was crucial in allowing Real to evade pressure situations and create different routes to progress. By switching quicker through midfield they were able to receive on the wings with more time and space and thus better situations to attack the box with crosses. Generally, the worse timing and reduced intensity of Liverpool’s pressing led to improved decision making in Real Madrid’s build-up situations. As a result, they had longer possession spells, and either broke through quickly by playing through to the forwards, or moving Liverpool’s block around and gradually deeper both creating chances and reducing their opponents’ counter attacking threat in the process. One of Liverpool’s biggest issues in the last third of the 1sthalf was an overly hasty use of possession, leading to many quick turnovers and feeding in to Real’s cycle of possession and territorial dominance. Unfortunately for Klopp’s side, this continued for much of the 2nd half for a number of reasons. One of the benefits of Real Madrid’s deep positional structure is strong stability in defensive transition moments due to the sheer number of players in defensive positions. This often comes at the expense of an intense counterpress, again, due to the low number of players in offensive positions. 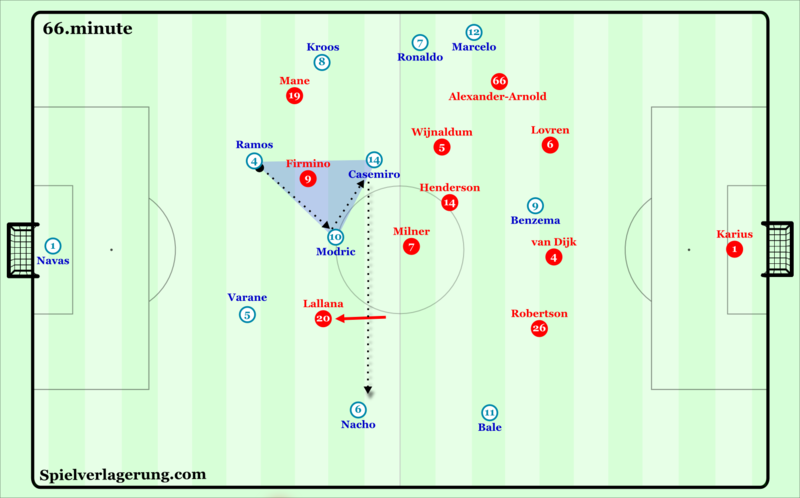 However, Liverpool often tried to spring quick counter attacks in the moments after winning possession, in turn playing directly into the heavily loaded areas of Real’s structure. 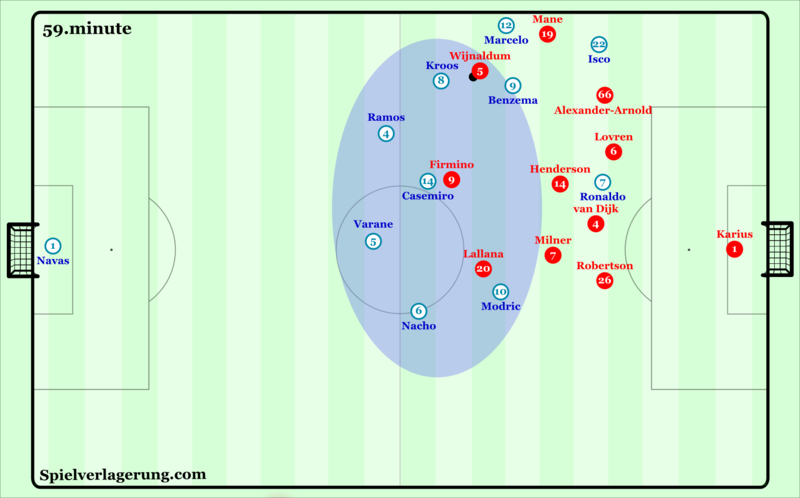 Since their attackers were often significantly underloaded, Liverpool’s counters often finished within their own half, allowing Real to further establish their control of the game. In a number of these situations Klopp’s men may have been better served playing more patiently, and taking advantage of Real’s low offensive presence to build attacks from deep. An issue they faced when trying to build attacks from deeper however, was increased intensity from the forwards and tighter man-marking from midfielders of their Spanish opponents. Liverpool struggled to play through this due to structural issues in their build-up, mostly starting from the back line. Particularly when Karius had possession, Lovren and van Dijk failed to take up deep and wide enough positions. Their narrow positions meant Real’s forwards could easily mark them without opening large passing lanes to midfield spaces. Additionally, the lack of depth meant Liverpool’s full-backs and midfielders lacked backwards passing options, as well as a small distance for the likes of Benzema to retain access to Liverpool’s first and second lines. As a result, Liverpool’s midfielders were largely unavailable and at times moved to wing areas in an attempt to become passing options. Even when chasing an equaliser, these issues meant that Liverpool’s best progressions came from playing longer and winning second balls to then attack the wings. In the latter parts of the first half, and increasingly in the 2ndhalf, Real Madrid made stronger attempts to play more on the right flank in contrast to their heavily left-sided focus earlier on. To do so, they attempted to balance their structure, with Isco playing more often on the right flank and Modric licenced to move higher to support Nacho. This was also improved by bringing on the eventual match winner Gareth Bale, who provided a constant presence on the right side. By starting more attacks on their right wing, Real could draw Liverpool to said flank, before switching quickly and receiving with more space on their preferred left wing. A key to this plan was Toni Kroos, and his increasingly central position when the ball was on the right wing. By moving more centrally in these situations, the German was easier to access quickly from where he could spread the ball with speed and accuracy to the likes of Ronaldo and Marcelo. His central position also meant he could offer Ramos an option to play through the 6 space when Real tried to switch from right to left through the defensive line. Modric was also used deeper in build-up more often, and his presence alongside Kroos or Casemiro meant two options to play into the 6 space, meaning Real’s defenders could bypass Firmino’s cover shadow easier. These positional changes gave Zidane’s men better stability against Liverpool’s pressing as well as creating better situations for the wing attacks that were eventually so decisive. Victory sealed an unprecedented 3rdconsecutive, and record 13thChampions league title for Real Madrid. This triumph was particularly impressive given that they faced the toughest draws at almost every level, from Spurs and BVB in the group stage, to the French, Italian and German champions en route to the final. 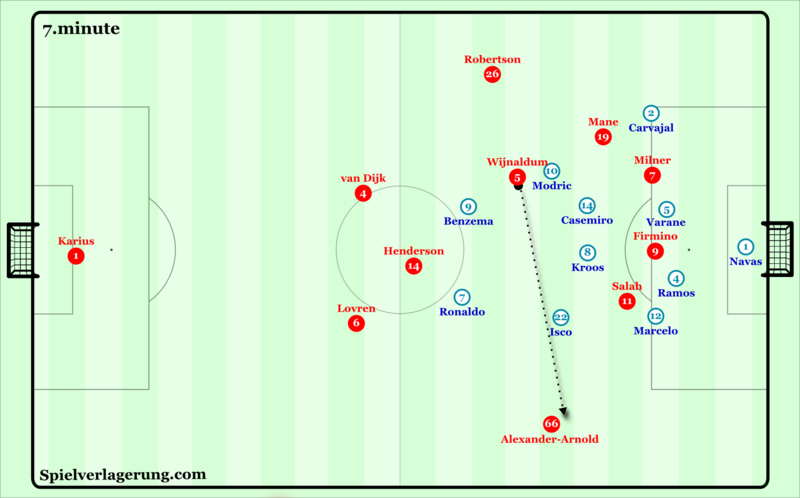 Whilst Liverpool edged the opening exchanges of this clash, there is little doubt Real dominated the majority of the game despite glaring mistakes for two of their goals. From Liverpool’s point of view there is little doubt the game changed in line with Salah’s injury and its psychological and tactical effects. It would have been interesting to see how long Liverpool’s intensity would have lasted with their talisman on the field. However, their inability to retain possession fed into the cycle of Real dominance which they were ultimately unable to survive without conceding. Interestingly despite the mistakes, all three of Real’s goals can be attributed to more general tactical factors, from Karius’ illogical haste in possession leading to the first, and Liverpool’s inability to control switches involved in both of Bale’s goals.